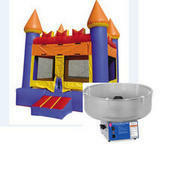 Get the best value and package a bounce house with a snow cone machine. 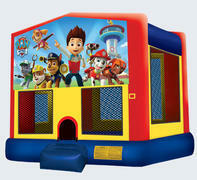 Get the best value and package a bounce house with a popcorn machine. 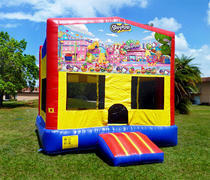 Get the best value and package a bounce house with a cotton candy machine. 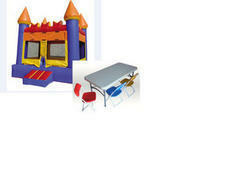 Get the best value and package a bounce house with 2 kid tables and respective 8 kids chairs. 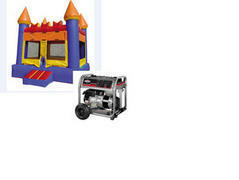 Bounce house with generator package. This is an original licensed theme from Disney's Alice in Wonderland. 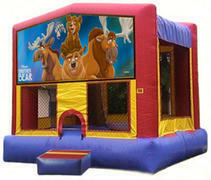 This is a great bounce house to rent for your next event. Aristocrats bounce house for the original Disney film. One of the only Avengers theme you will find. Features Ironman, Thor, and Cpt. America. 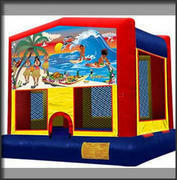 This is a great bounce house to rent for your next event. 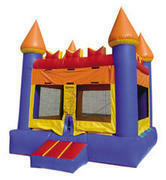 Barbie princess bounce house measures 13ft wide x 13ft length x 14ft tall. 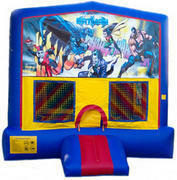 This is the original Batman theme bounce house. 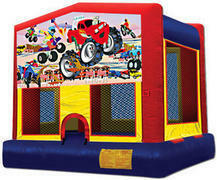 This is a great bounce house to rent for your next event. This theme is the Disney Film "Big Brother Bear". 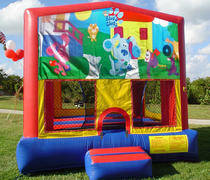 This is a great bounce house to rent for your next event. The classic Blues Clues. Very hard to find but always a great theme. 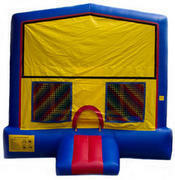 This inflatable fun house can be used as a colorful option for any theme. 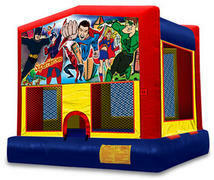 You can use this bounce house or you can take advantage of the velcro interchangeable panels. Call us to see if we have a theme that matches your event. It measures 13ft wide x 13ft length x 14ft tall. 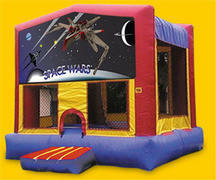 See other bounce houses if you prefer a theme. Robo Wars that transform in battle. 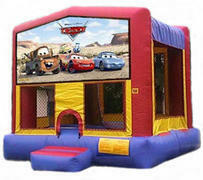 The original Cars bounce house with all the popular movie characters.Lighting McQueen and Mader off to a new adventure. 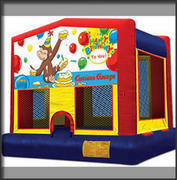 We are one of very few business that carry the Curious George bounce house theme. Reserve it while this theme is available. 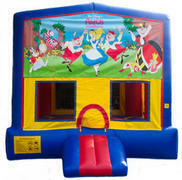 This Disness Princess Bounce House is one of the most popular themes for girl's events. It measures 13ft x 13ft. Place your order now to reserve availability. 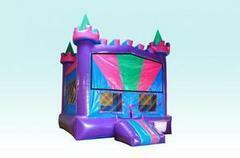 This inflatable Pink and Purple Castle is a must for girl's parties. 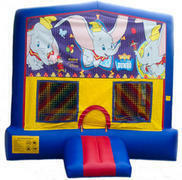 The original Dumbo bounce house from the popular Disney film. 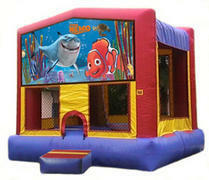 This bounce house theme is the original Finding Nemo from Disney. 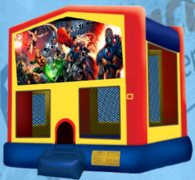 Frozen theme bounce house measures 13ft wide x 13ft length x 14ft tall. 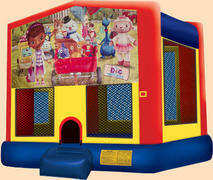 This image is for illustration purposes only the theme is exact but bounce house colors will vary. 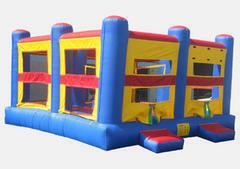 This giant bounce house is great for accomodating an event with many children. Can handle 800lbs at one time. 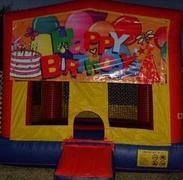 This is a very colorful and ideal "Happy Birthday" theme bounce house. 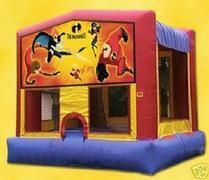 This Incredibles Bounce House is from the original Disney films. It measures 13ft x 13ft. Place your order now to reserve availability. 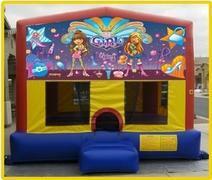 Its a Girl Thing with brats bounce house. 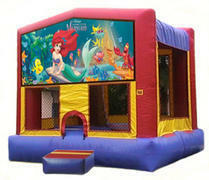 The Little Mermaid bounce house is great for daughter's next birthday party with Ariel. 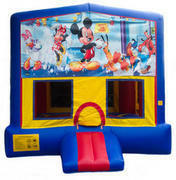 The Mickey Mouse bounce house is the theme that all children love for their party theme. Minion-mania! These little characters have won the world over. 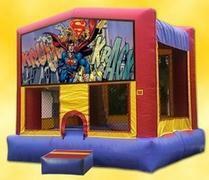 Great bounce house for your next event! 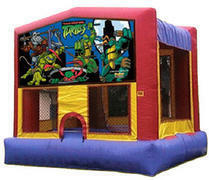 Ideal for a Ninja Turtles party theme bounce house. 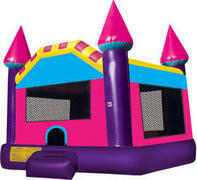 This pink castle is great for any girls event. 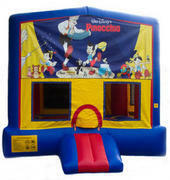 The original Pinocchio bounce house for your next event. 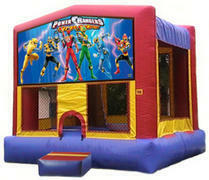 The Power Rangers bounce house is as popular as ever. Reserve it while available. New! Purple castle module with a brand new design that features detailed cones and beautiful rich colors. Shopkins are very popular and a great addition to your event! The Star Wars saga continues. 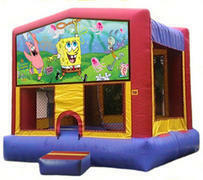 Get your bounce house for your next party. 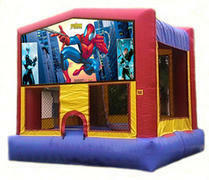 This Spiderman bounce house is always popular for your child's next party. For a great Spidey adventure place your reservation online. 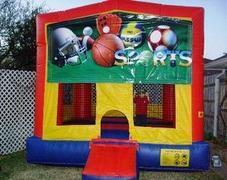 This Sports Fun House is great for any sports theme. 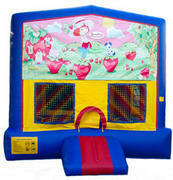 This Strawberry Shortcake bounce house is great for your next birthday party. 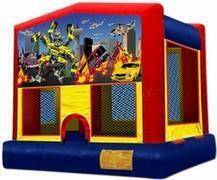 This is a great bounce house for all train lovers. 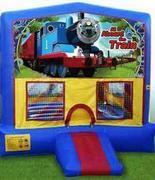 Reserve your Tomas Train bounce house today. This Tropical Paradise theme is great for you next beach party or luau theme. 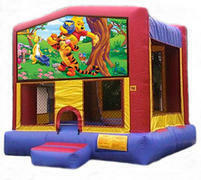 The Winnie the Pooh bounce house is great for all children. 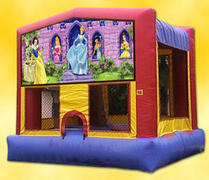 This World of Disney bounce house measures 13ft wide x 13ft length x 14ft tall. 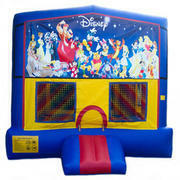 This bounce house features several of Disney's most popluar characters such as Mickey Mouse, Winnie the Pooh, Tigger, Alice in Wonderland, Disney Princesses and many others.